Understanding paper grain is vital when creating handmade books. This blog post and video explain what paper grain is, why it’s important and how it is determined. Grain refers to the direction in which the paper fibers are laid down during manufacture. Note that is only commercial made paper that has a grain, most handmade paper does not. When you purchase paper, if a paper is labeled as Short Grain the grain runs parallel to the short edge of the paper, and if it’s labeled Long Grain, the grain runs parallel to the long edge of the paper. Book board, book cloth and decorative papers also have a grain. Why is Paper Grain Important? The grain direction of paper, cloth and board has a significant effect on a book’s level of craftsmanship. Whenever possible, the grain should run parallel to the spine of the book. If we fold against the grain, the fibers crack and the book will warp and not lay flat. Sometimes you cannot avoid working against the grain, in this instance, pre-score the paper before folding. How Do I Determine Paper Grain? Gently bend the paper in both directions to see which yields more easily. The paper fibers run in the direction that gives the least resistance. Fold and crease the paper first in one direction and then the other. If the paper fibers crack and break, you are folding against the grain. If the fold is smooth, you are folding with the grain. This method works best with thin paper. Lightly spritz the paper with water and it will curl in the direction of the grain. 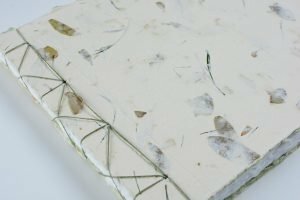 I hope these tips and video help give you an overview of paper grain and why it’s important for creating handmade books. Please leave comments or questions below or in our vibrant community on Facebook. If you don’t want to miss the next blog post or video, please sign up for my newsletter below. Your ability to make all the ins and outs of book making is admired here. You are clear, concise and articulate. thank you for taking your time to make the videos. I look forward to more of them. I never knew, although I suspected, that paper had a grain. Thank you for this video and the examples of how to determine the grain and the importance of it. Excellent video packed full of info that I did not know! I have made many books for art but never learned about the paper grain! Thank you. Excellent technique on how to determine paper grain! Thank you! Thanks, Ali, for an intriguing video! I’m a women’s clothing designer and think about the grain of cloth all the time. I kind of wondered if there were a grain to paper, but figured it was ‘just my imagination.’ So interesting to learn about paper from a pro. And your papers of the month are beautiful!! Well, that explains what happened when I made an accordion fold sketchbook from a pad of 100lb vellum bristol. I’d never seen paper crack along a fold like that. Never occurred to me to check the grain, just looking for the direction that would give me the longest sheet to fold. I echo the other comments here – thanks for sharing all this information and especially for taking time to make the video. Oh is that where that saying comes from: “Don’t go against the grain!”. Very informative. Wonderful presentation. Very clear and concise instructions. Thank you!